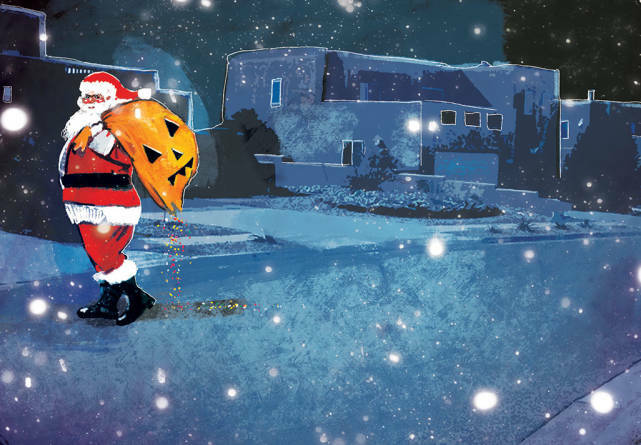 Above: Nothing says Christmas better than trick-or-treating. Illustration by Odessa Sawyer. AT OUR TAOS HOME, we stayed up most of the night on Christmas Eve, and this year was no exception. We had managed to squeeze in a little over an hour of sleep when my cousin shook me and reminded me that we needed to get up. Usually it was difficult to get me out of bed on a cold winter’s day. Our unheated basement bedrooms were freezing. If you exhaled, you could see your breath shoot out from the edge of the homemade quilts. This morning was different. Although it was only 5:30 a.m., I immediately pushed back the heavy covers and grabbed my clothes, laid out the night before. Along with other cousins and nieces and nephews who had been sleeping on other beds or on mattresses on the floor, we made our way quickly to the kitchen, at the top of the stairs. We sat on wooden benches around the long table and gulped hot bowls of oatmeal, thick slices of homemade bread, and chokecherry jam. We created a ruckus putting on our boots, coats, hats, and mittens to brave the cold December morning. Having been blessed with over a foot of snow the previous night, we looked forward to stomping through it. Friends and family who visited throughout Christmas Eve told us that the roads were icy and dangerous, but we would be walking, not driving. There was nothing to fear. Armed with clean, white empty flour sacks, we tramped out into the early morning with darkness surrounding us, expecting the sun to soon light our way. Our challenge: visit as many homes in our neighborhood as possible without freezing to death. There was no deterring us. We focused on the prize at the end and forgot, from year to year, the pain of being extremely cold. Upon arriving at the first neighbor’s house, we stood in front of their main door and shouted at the top of our lungs,“¡Mis Crismes!” (“My Christmas!”). On this special morning, though, that means, “Here we are and we would like some goodies!” We were practicing an old and now outdated village ritual, sometimes called oremos, of seeking treats door-to-door. As we continued on to the next house, we could hear other children yelling at other homes beyond us. Soon, groups of children in twos, threes, or more passed us going the opposite way. Then we spied other groups ahead of us, walking in the same direction. No child would miss this for the world! It was one of the highlights of our year—trick-or-treating in December. The morning air was crisp, and the sun finally made its majestic entrance over the mountains to the east. A world of wonder appeared before us. Now the snow sparkled everywhere but where our footprints had broken through to the frozen earth below. The sight exhilarated me and stopped me in my tracks. The others continued on, not knowing I had paused. It was as though I was alone, suspended in a moment of time. I blocked out all noise and held my breath to take in the display all around me: the tree limbs weighed down with snow, the roofs of adobe houses smeared with white icing, the icicles dripping from canales. The spell was broken when one of my cousins turned around and shouted, “Hurry up!” I broke into a run to the next house on our route. At every house, we were given different kinds of candy and peanuts. Some people would give us an apple, but one of the best treats one could get was an orange. I guess they were very expensive in the 1940s and ’50s, or just not available. They were so precious that, when we got home and decided to eat an orange, we would wash it well. We placed the rind in a jar with water and left it for a day or two so the water would take on the flavor. Then we would add some sugar. A great orange drink! Growing ever colder, we encouraged one another by jumping up and down and moving quickly from house to house. One good thing about our flour sacks was that, as they grew heavier, we could sling them over our shoulders. After a couple of hours, some of us could not think of trudging to one more house—especially as we thought of Grandma’s warm kitchen and the living room’s blazing fire. Plus, we had gorged ourselves with sweets from our sacks. With freezing toes, hands, and noses, we made our way back home. We had stood up to the elements and won. More important, we had enough sweets to last for weeks beyond Christmas. On the porch of Grandma’s house, we left our soggy outer clothing to dry. We entered her kitchen, filled with the aromas of coffee, chile, posole, and chicos simmering on the woodstove. The beginning of another wonderful Christmas Day.